My inspiration for this piece comes from my love for science and microscopy imaging. Microscopy and astronomy share many core concepts which stem from the way light behaves. Many of the detectors that capture and record images of a human cell or the moon for example, are monochrome and capture black and white images, which are then pseudocolored. This particular pseudocolored image of the moon demonstrates the topography of the lunar surface. Violet/blue represents the lowest spots on the lunar surface whereas red represents the highest points. 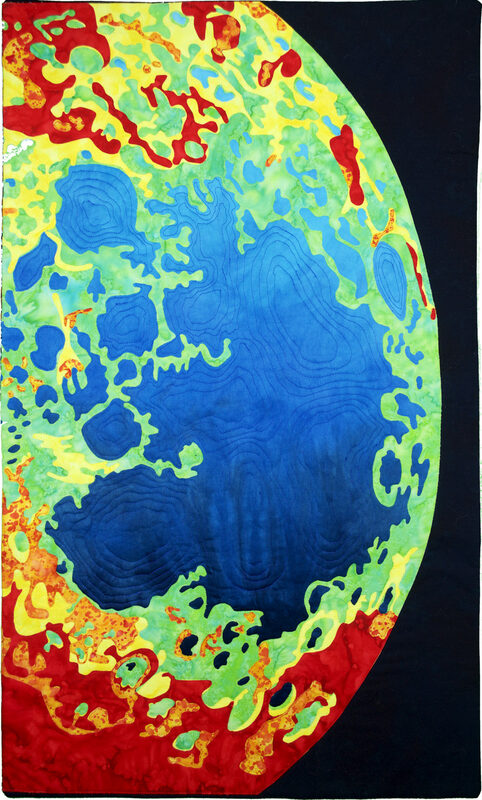 I chose to depict a section of the moon rather than the full face due to the size constraints of the final quilt. Although my quilt is not scientifically accurate because I did not copy a true topographic image, it is my original artistic interpretation of a pseudocolor image of the moon. Rough-edge applique, reverse applique and machine quilting. Hand dyed fabric, Batik fabric and fusible web.